El vehículo pretendió ser un cañón autopropulsado de apoyo a la infantería sobre la base del tanque M5. La variante M8A1 presentaba una torreta modificada y un armamento mejorado. Desde septiembre de 1943 a enero de 1944 se construyeron un total de 1778 vehículos. The M8A1 is very mobile, which, when combined with its good DPM, absolves the con of low armor. Once the crew reaches 100% in Camouflage, the M8A1 is difficult to detect. It's meant for support. A forward or close combat position, unless fully and well thought out, will result in a quick return to the garage. Although the 76 mm AT Gun M7 L/50 is a better money maker than the 57 mm, the 57 mm is superior in battle performance due to its greater penetration and higher DPM. This little tank actually has quite a bit going for it. A turret, speed, small profile and an excellent gun. The 57mm gun is a good all rounder, making up for its slightly low alpha with a high rate of fire. 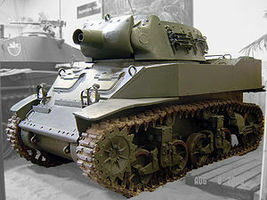 Speed, and a turret give this tank added flexibility, compared to similar tiered tank destroyers. Additionally, it can be quite difficult to spot, especially if you have the Camouflage skill and/or a camouflage net. Never attemptto use the "armor" this TD is jokingly equipped with. The M8A1 belongs in a supporting roll, whittling down opponents who don't know any better, or those that simply can't see you. The Continental R-975-C1 engine and the 57 mm Gun M1 L/50 carry over from the T82 and can be installed immediately.